Redford, Scott. 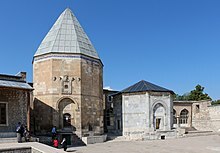 The Alâeddin Mosque in Konya Reconsidered. Artibus Asiae (Zürich: Artibus Asiae Publishers). 1991, 51 (1/2): 54–74. ISSN 0004-3648. JSTOR 3249676. doi:10.2307/3249676. Alâeddin Mosque in Konya. ArchNet. （原始内容存档于2006-02-18）.